tyler came over the other day and showed me some stencil art that he had done on his tshirt. i was immediately drawn to it and thought i'd give it a shot. 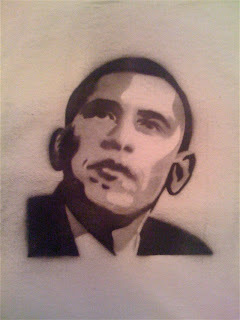 this is my second attempt of an obama shirt, and though it's much better than the first, i'm still getting overspray. at least the tshirt were only $2.50. i'm thinking i need to use thicker paper or acetate. meaning now i have to drag owen back to a.c moore for the 3rd time since yesterday. i'm looking for ideas for tshirts too... so if you've got 'em, send them my way!